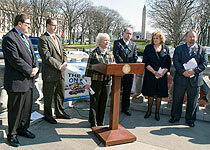 Rep. Tina Pickett joined her colleagues Wednesday in announcing the Marcellus Works legislative package to encourage governments and mass transit to convert to cleaner burning natural gas vehicles. The package has the potential to further create jobs and reduce harmful emissions from traditional fuel sources. Pickett is the sponsor of one of the bills that offers grants to local governments. Rep. Tina Pickett (R-Bradford/Sullivan/Susquehanna) today announced legislation she is sponsoring to make it easier for local government entities to transition their vehicles from traditional gasoline to clean natural gas. “With the abundance of clean natural gas being produced from the Marcellus Shale, there is a great opportunity before us to keep much of this resource here, create good jobs and protect our environment at the same time,” said Pickett, who participated in a Capitol press conference Wednesday to announce a package of related legislation called Marcellus Works. Pickett’s House Bill 1088 would create the Keystone Fuel Incentive Fund, which would essentially retool the Alternative Fuels Incentive Fund so that it will encourage the use of compressed natural gas vehicles. The package does not call for any additional taxes or fees on Pennsylvania residents. Under House Bill 1088, 65 percent of the fund would be for grants to municipalities, political subdivisions and school districts for natural gas fleet vehicle conversions. If all eligible governmental applications under this section are filled, then it would be opened to the private sector including non-profits. Also, 23 percent of the fund would be for grants to citizens of this Commonwealth for the incremental cost of a bi-fuel vehicle. Bi-fuel vehicles can run on both gasoline and natural gas or diesel and natural gas. Ten percent of the fund would be grants for clean natural gas taxis, and the remaining 2 percent would be for administration costs. The Marcellus Works package is designed to make Pennsylvania an energy leader by encouraging the development and growth of small businesses and the much-needed jobs they will bring. Other bills in the package are designed to create tax credits for private fleet vehicles; ensure that some new buses purchased by large mass transit systems use natural gas; provide loans for large mass transit systems; and offer tax credits to encourage construction of natural gas fueling stations along the state’s major highways. “I am very excited about the opportunities this package of legislation would create, and am optimistic for its swift passage in the House, through the Senate and onto the governor’s desk,” Pickett added. For more information on the “Marcellus Works” plan, visit RepPickett.com.